Tuesdays….one of my favorite days to blog! Why you ask 😉 Because I love making lists 😀 And because it’s Tuesday it’s time for another Top Ten! Today’s topic is “Top Ten Characters You’d Like To Check In With (meaning, the book or series is over and you so just wish you could peek in on the “life” you imagine they are leading years down the line after the story ends).” I’m so excited for this topic! It was hard to narrow down to just ten characters. ***SPOILER ALERT*** There will be minor spoilers to the books mentioned as I talk about what I want to know about these characters. If you haven’t read the book, skip that entry! 1. Harry Potter and the whole crew 😀 – The Harry Potter Series happens to be one of my all-time favorites and of course I would have loved if J.K. Rowling never quit writing them. I want to know what it is like for Harry, Hermoine, and Ron now that their children are at Hogwarts. What are the children like? Do they get into just as much trouble as their parents did? What did they do in their free time now that there isn’t a Dark Lord to fight? 2. Bella Swan or I guess Cullen now – Yes, I like my vampires sparkly 😉 Even though Twilight is no longer in its heyday it is still one of my favorite series. I really don’t have a reason other than it was a fun, easy read. It also kickstarted my reading addiction after the dark days of college. So I absolutely want to check in with Bella and Edward and the whole Cullen family to see how immortality in the rainy Pacific Northwest is treating them. 3. Katniss, Peeta, and Gale – The Hunger Games is another of my all-time favorites and I’ve read it more times than I can count. I want to see how Katniss is doing now that she is older, a mother, and with Peeta. I want to see their children play in the meadow and hear how they tell the children the story of the revolution that allows them to do so. 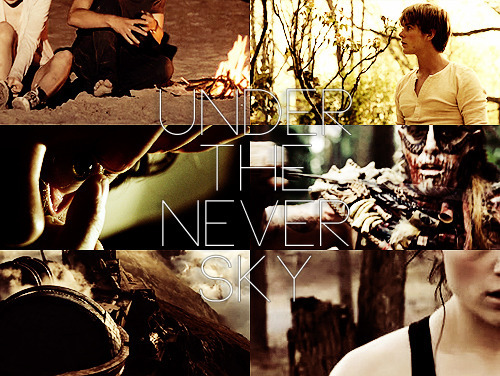 And I want to know how Gale is. I always felt sorry for him, out in the wings, hoping Katniss would choose him even though I wanted her with Peeta. Did he find himself a woman? How did the revolution affect him, especially knowing he may be responsible for all those children’s deaths? 4. Tobias – Oh I could write a whole post on Tobias, or better known as Four from Divergent. The whole series had me on an emotional roller coaster and even now I can’t think about the ending without getting a little teary. So how is Tobias? What is he doing now that he knows the truth and….ugh…..Tris? Has he moved on? 5. Mrs. Darcy – This list would not be complete without me mentioning one of my favorite stories Pride and Prejudice. How is married life for the dear Mr. and Mrs. Darcy? Is their happily ever after still happy? Did they have children? If so how many? Are they just like her or him? 6. Misha from Tales of Ever by Jen Wylie – I seriously love this collection of short stories and Misha the MC is amazing! She’s fun, quirky and brave. Here she is, trapped in another dimension for criminals and she makes friends, searches for her father, and ultimately conquers her fears and learns how to control this fire power she has. It’s really quite awesome! I want to know how she is. She’s still trapped in Ever with her friends. What’s going on? Are they trying to find a way out? 7. Perry and Aria – They found the Still Blue in the Under the Never Sky series and are building a new settlement. How are they? How do they spend their time now that the responsibility of leading a people is off their young shoulders? Are they happy? 8. Malachi and Lela – Guards of the Shadowlands was one of my most favorite finds and Malachi and Lela are two of my favorite characters. They’ve been given a second chance at life. Are they taking it? Are they happy? I sure hope they are. What do they do now that they have no Mazikin to fight? 9. Sookie and Sam – Another favorite series, that is known mostly for its HBO series True Blood. Can I just say that I hate the show and love the books? The show destroyed the characters…..ok sorry I’ll get off that soapbox 😉 So I LOVED the ending to this series so much but I know a lot of people were disappointed. I thought the author gave plenty of hints throughout the series on who Sookie would be with in the end and it was definitely my ship 😀 I want to know more about Sookie and Sam’s relationship. How did the transition from friends to lovers go? Was it smooth? Are they happy? Because they deserve to be! What characters do you want to check in with? I could have kept going all day with this list. I love my books and I get so invested in the characters that when a series or standalone book comes to an end, I have a hard time letting go! A lot of the time I create a life for them in my head so I can move on to the next book. Is that odd? Do any of you do that? You have an excellent list. I agree with most of them on here. Especially the Harry Potter crew. It would be great to know what they are up to. I’d also like to check in on Tobias and the Chronicles of Narnia kids. Yes! I want to know how the HP crew is doing now that they are adults. 🙂 Thanks for stopping by! I love the eclectic nature of your list! You’ve got classics, contemporary classics and everything in between. Great Top Ten Tuesday list!! My take on Susan from the Chronicles of Narnia was that she lost her faith and would never join the others again. At least, that was what seemed to be implied. Whether or not she was on the train with them, I don’t remember and would have to reread the last book to see if I could glean that detail. Tamara Lowery recently posted…Book Reviews! That was my take too! I just finished reading it with my son and she was not on the train. She was busy at college with her new beau I believe is how Lewis worded it. Either way I couldn’t imagine being kept from my family or losing them in such a way! What a pretty blog! I’d forgotten how the Pevensies’ story in the Chronicles of Narnia ended. Mr. and Mrs. Darcy is a great choice too. I would forever be happy with an update on all the HP crew. 🙂 I also wouldn’t mind catching up with Bella and Edward and Mrs. Darcy. I can’t say I care to much about Sookie and Sam since I was never a fan of those two. Great list! I also want to know about everyone in Harry Potter, Lizzie and Mr Darcy and Susan!